The Gola Malimbe Malimbus ballmanni is a restricted range species that was described as recently as 1974. The Gola Malimbe (photo right: photographer Nik Borrow) is the only ploceid in the Upper Guinea high forest that has a yellow breast, black belly and yellow undertail-coverts. 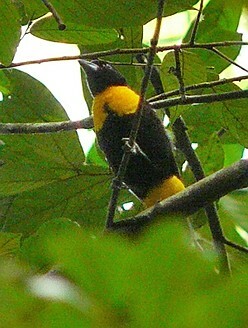 The nape is yellow in the male and black in the female. The immatures is greyer, with some yellow on the head, and a pale bill. 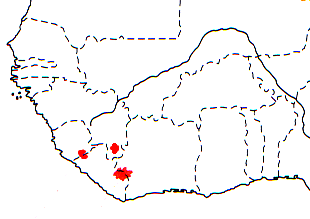 Three Gola Malimbe populations are known: in eastern Sierra Leone (Gola Forest) and adjacent western Liberia; in eastern Liberia and adjacent western Ivory Coast, and recently found population in south-eastern Guinea (see map below, based on Birds of Africa). No races are recognised, but the Gola Malimbe has also erroneously been described as M. golensis. The Gola Malimbe inhabits the middle storey of primary lowland rain-forest. It is also found in logged high forest and in mature secondary forest. The species is solitary, or found in small groups, and usually occurs in mixed-species foraging flocks through the year. The Gola Malimbe feeds on insects up to 3 cm long, including grasshoppers and mantids. It forages actively, by gleaning green leaves and horizontal twigs for insects. It also investigates vertical twigs and liana-covered branches. The Gola Malimbe rarely probes in dry, rolled leaves. Foraging is usually between 8 and 22m above the forest floor. The Gola Malimbe is probably monogamous. It is a solitary nester, and nest-builds is co-operative. The male sings and displays by facing the female, with the yellow breast and undertail-covert feathers lifted. The nest resembles an inverted sock having a globular chamber and tubular entrance (about 25 cm) pointing down. The nest is suspended from the tip of vertically hanging lianas. The nest is sited between 8 and 21 m above the ground. Several Gola Malimbes from a mixed-species foraging flock will visit a nest site several times a day at irregular intervals; some will weave whilst others fly to and fro with building material and wait for a turn to build. Up to five individuals work on a nest simultaneously, with males tending to work on the attachment and outside of the nest, and females working mainly on the inside and on the entrance spout. There are no PHOWN records for the Gola Malimbe (see PHOWN summary), and many are needed. Submit any weaver nest records to PHOWN (PHOtos of Weaver Nests) via the Virtual Museum upload site.